I’ve been looking forward to seeing Chicago for ages. Ever since my mate Anton came here and told me about their special pizzas a few years ago. 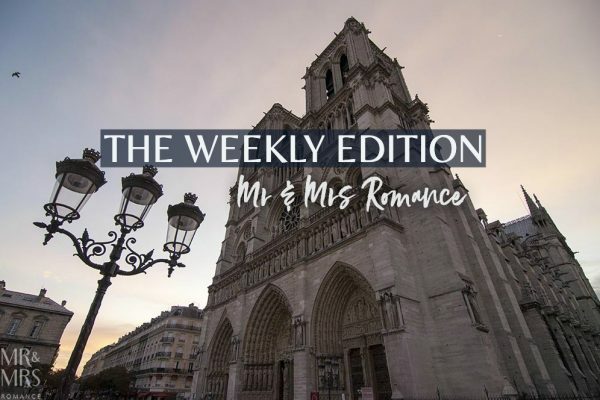 What we find here is one of the most interesting, friendly, easy to-get-to-know cities we’ve visited. I’m also a bit of a mug for cities with rivers running through them. The title picture is of our first morning in Chicago. We arrived at our hotel in the early hours. 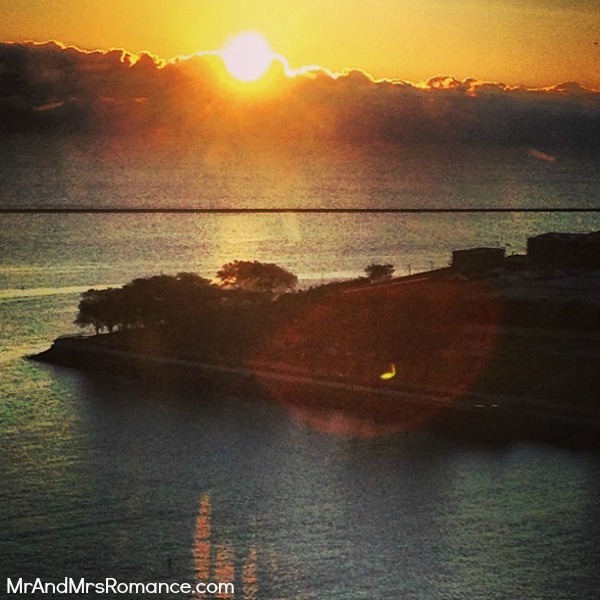 We weren’t in our room at the W Lakeshore Hotel long before the sun came up over Lake Michigan and we were treated to this view. Not bad, ay? 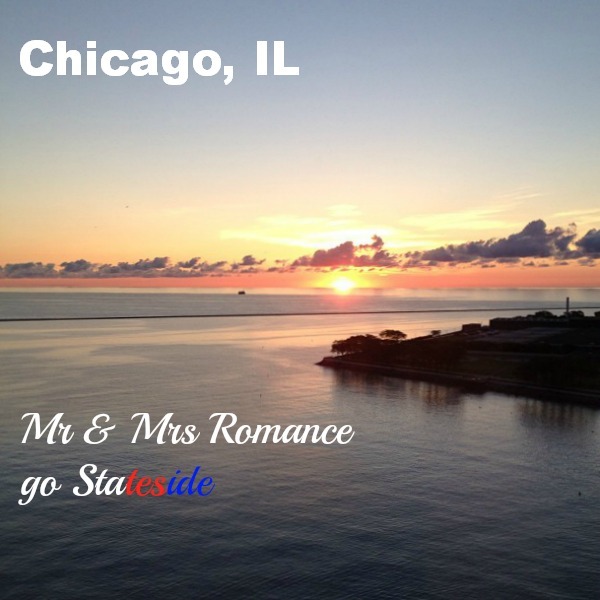 After a few hours exploring Chicago and doing a bit of shopping, we check Yelp for a nearby bar. We strike gold with this place, the Plymouth Rooftop Bar and Grill in the Loop, south of the Chicago River. 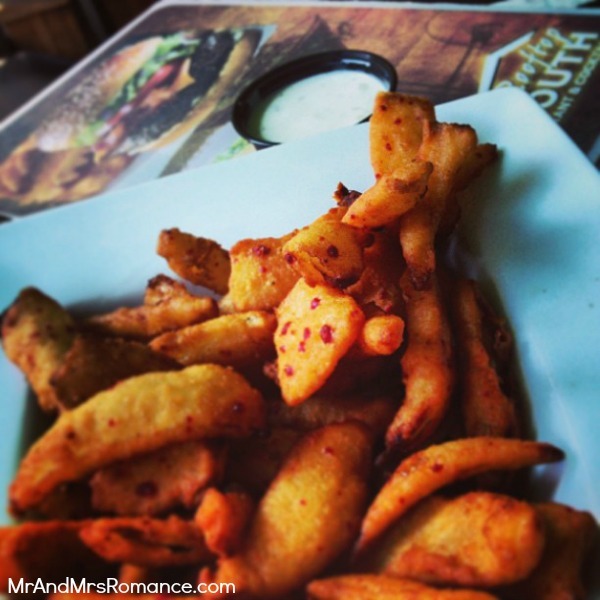 We enjoy a couple of beers and these incredible onion petals – fried onion blooms with a spicy batter! The views of the Harold Washington Library and elevated train station are good too. On our walks around the Chitown, we find loads of lovely fountains. 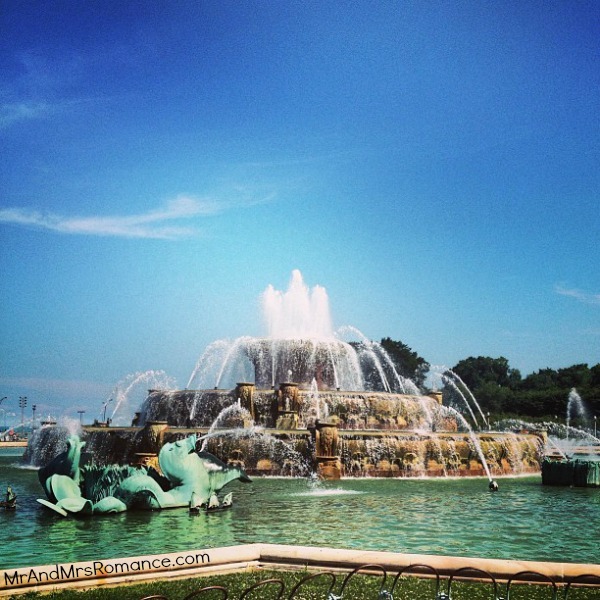 This one – the Buckingham Fountain in Grant Park on the shores of the lake. Pretty, isn’t it? We go to Millennium Park to check things out. 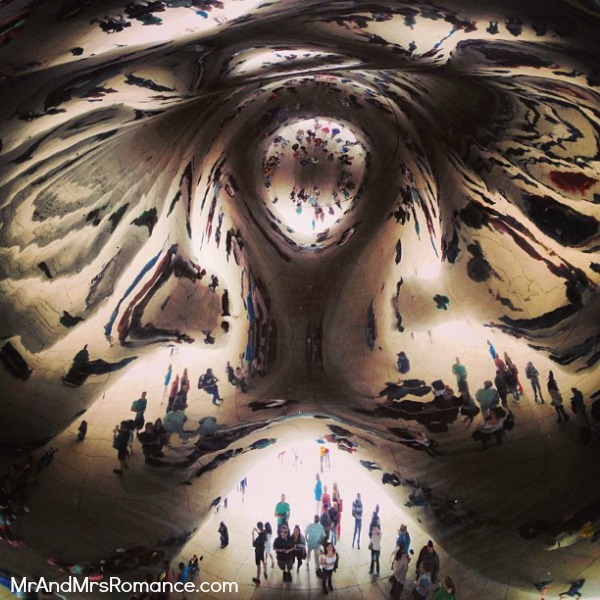 Cloud Gate – aka the Bean – is there. Some amazing reflections of the city and the people looking at it. One of the most interesting pieces of public sculpture I’ve seen. Underneath the Bean things get even trippier! And walking around under there is even weirder still! The Chicago River is beautiful. It also flows backwards. To make the city more sanitary, engineers reversed its flow back out into Lake Michigan. 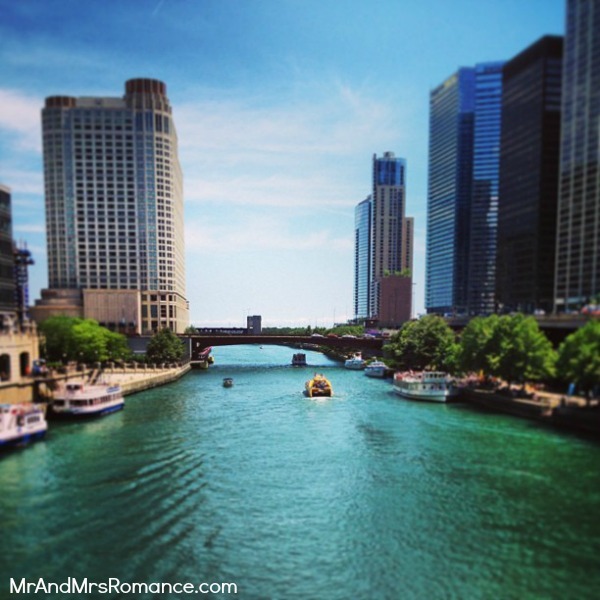 We take an historic river cruise along the Chicago after about fifty people – locals included – told us we should. We’re glad we took their advice. It’s not only interesting, it gives us a great view of the city. 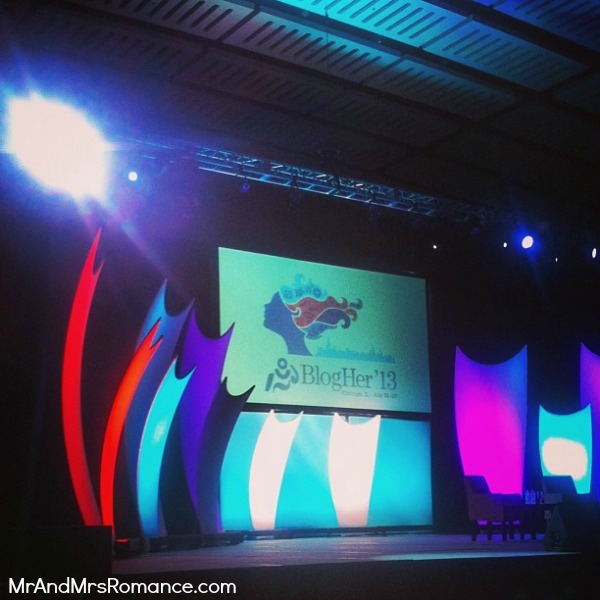 Mrs Romance takes care of business at the 2013 BlogHer conference. It’s once again extremely well-attended; so much so that I believe it caused the internet to stop working in the east of the city for most of an evening. Meanwhile, left to my own devices, I go exploring. North of our hotel is Oak Street Beach. It’s pretty big, though a lot of its sand is taken up with beach volleyball courts. All the way along the lake’s shoreline, the promenade is packed with people running, walking and cycling. If you’re after a quiet stroll along the lake, go somewhere else. Everyone who’s here is either in a mad hurry, has someone after them or is just exercising. Mrs Romance tells me it’s the latter, but my cynical mind makes me believe otherwise. 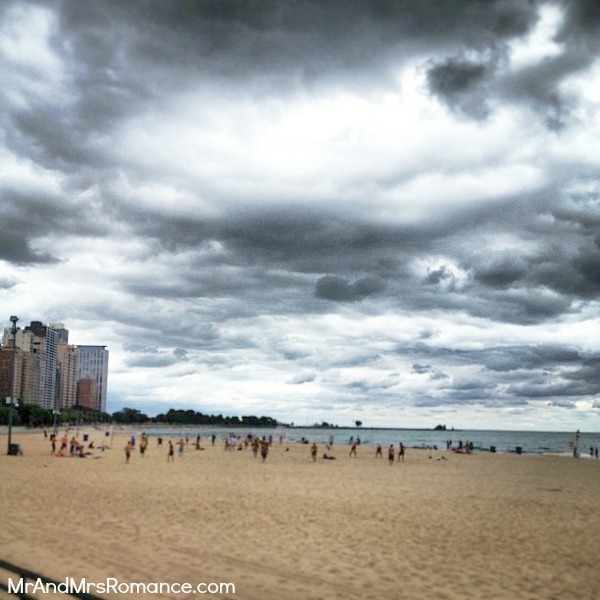 Instead of exercising I choose a different path at Oak Street Beach. 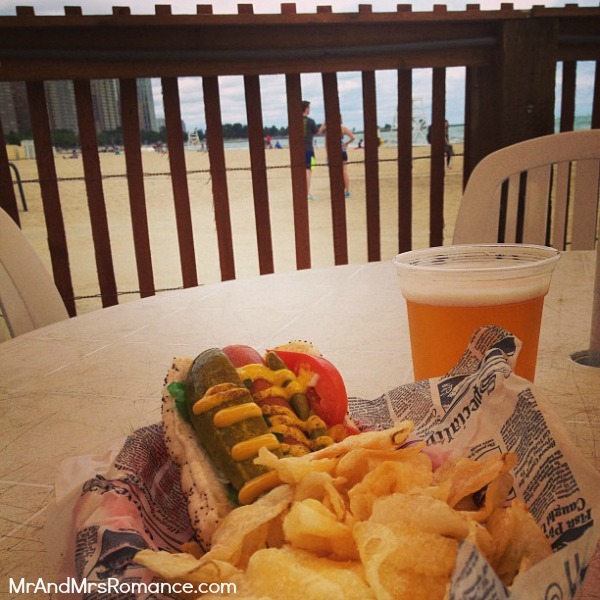 A beer and a Chicago style hotdog for me! ‘Chicago style’ means you get a load of weird pickles with your hotdog. It was tasty but the pickles were a bit confusing. It rained a bit yesterday, so there’s a bit of chop on Lake Michigan as I walk to Oak Street Beach. 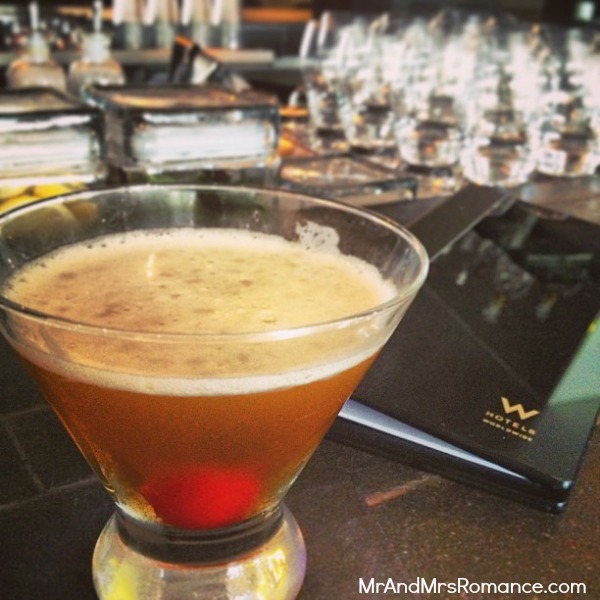 Much like the cheese counter at a good deli, there’s something so tempting about a good-looking hotel bar. And much like the cheese counter, the hotel bar usually ends up with a lot more of my money than I initially intend. Do you really think this is the only Manhattan I have here? Well, then you don’t know me very well, do you? 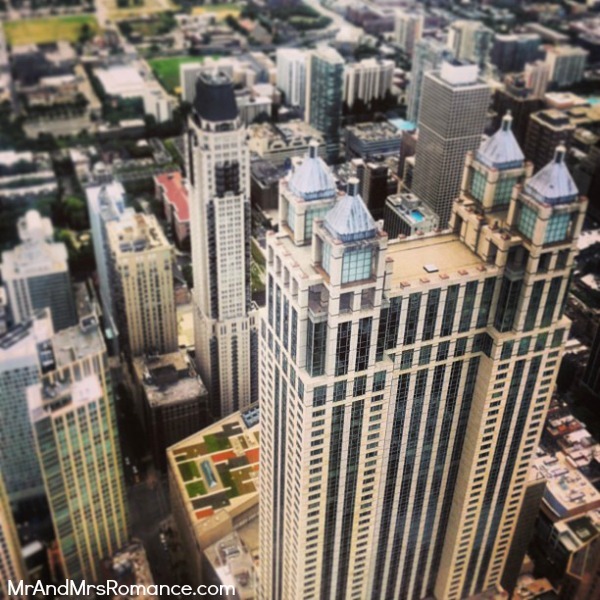 Mrs Romance is busy one night with BlogHer folks. I take it upon myself to explore some of the bars and cigar lounges of the city. Here’s the end result of my foray: the very best burger I’ve ever eaten. Every score I give a burger from now on – and posthumously – is benchmarked by this beauty. A blue cheese butcher shop burger (literally has my name on it!) 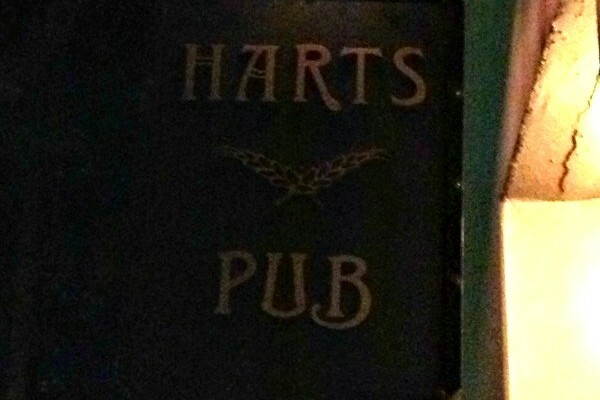 from Sullivan’s Steakhouse. If you’re ever in Chicago, GO TO SULLI’S! Sullivan’s is also cigar friendly. 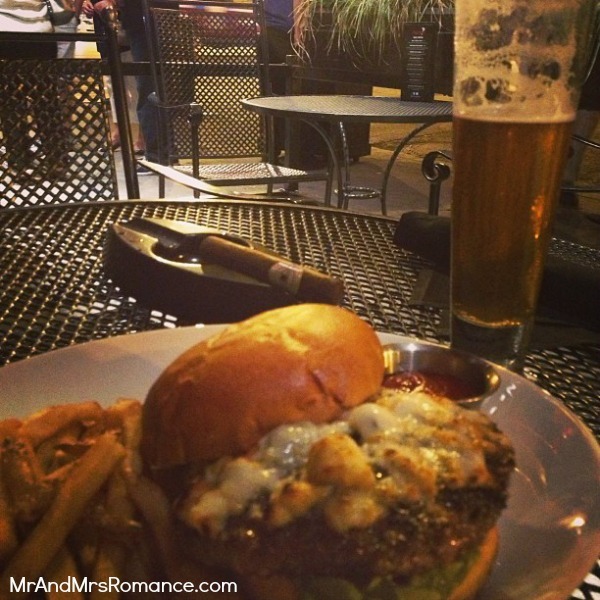 The streetside seating is perfect for a smoke. This is what I indulge in after my magnificent burger! It’s a great way to finish off a surprisingly fun solitary evening. If you’re interested, this is a cigar I bought in San Francisco. 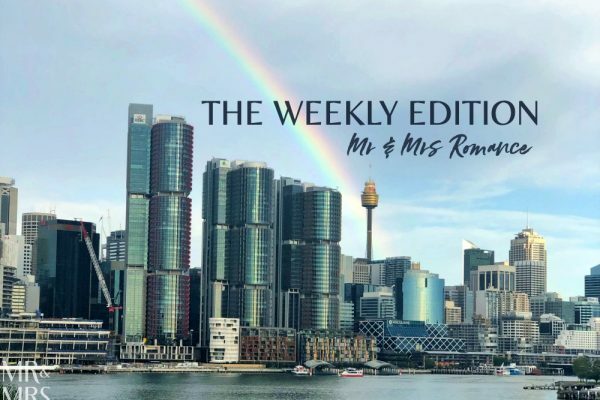 Enjoy the review! 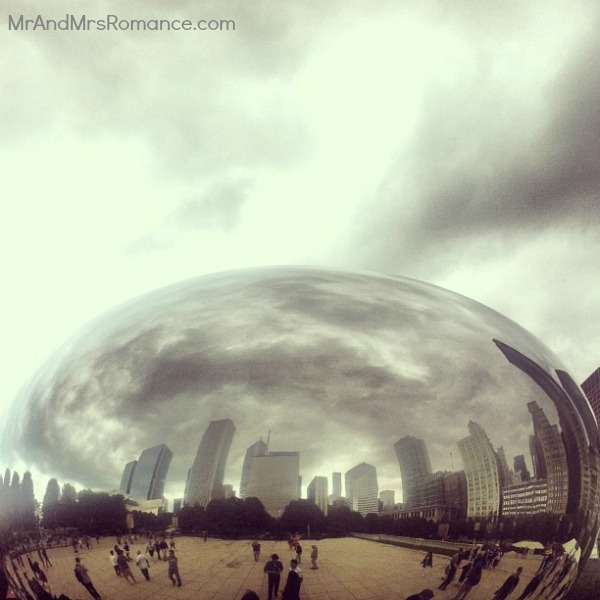 With BlogHer 2013 over, Mrs Romance is free to explore the city with me. We head up the John Hancock building, the second tallest building in Chicago (tallest is the Sears – aka the Willis – Tower). From the top of the Hancock, you can see four States: Illinois, Michigan, Wisconsin and Indiana. Check out the views! 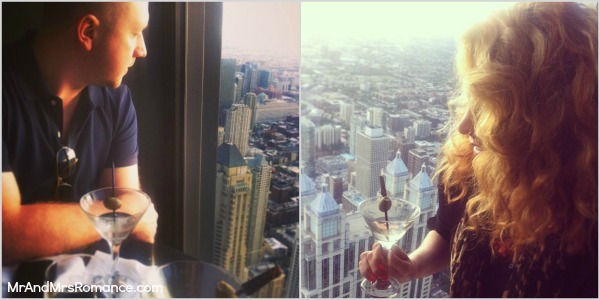 We score amazing seats at the Signature Room bar at the top of the Hancock building. We sit and stare out the four states over a great martini. 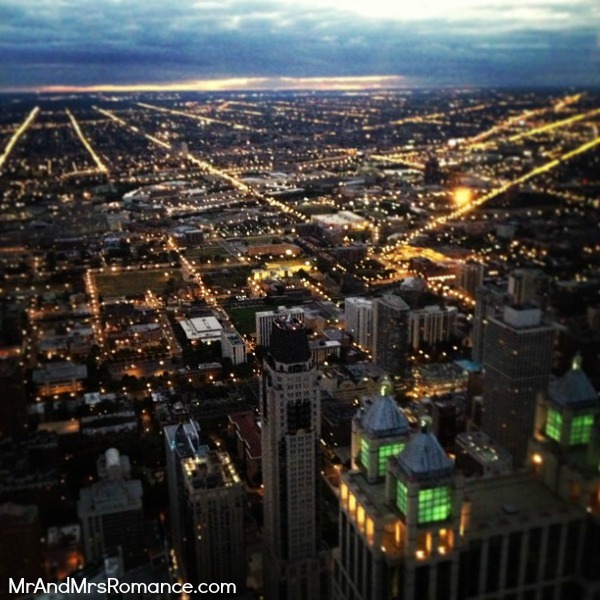 As night falls, and the city lights come on, Chicago shows its real potential. The city of Chicago is incredible. Tall buildings, lots to do, crowds… but the villages to the north are just as interesting. 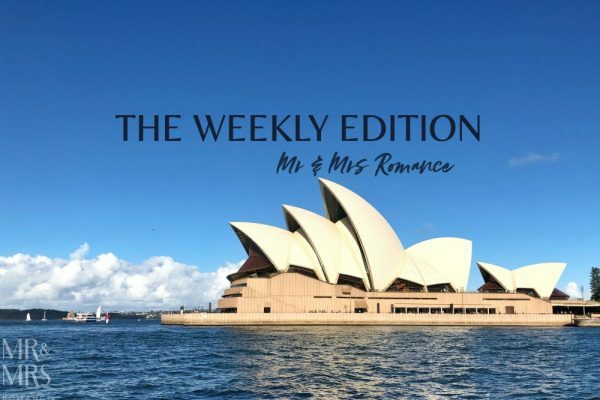 We head to a couple to see what the go is. 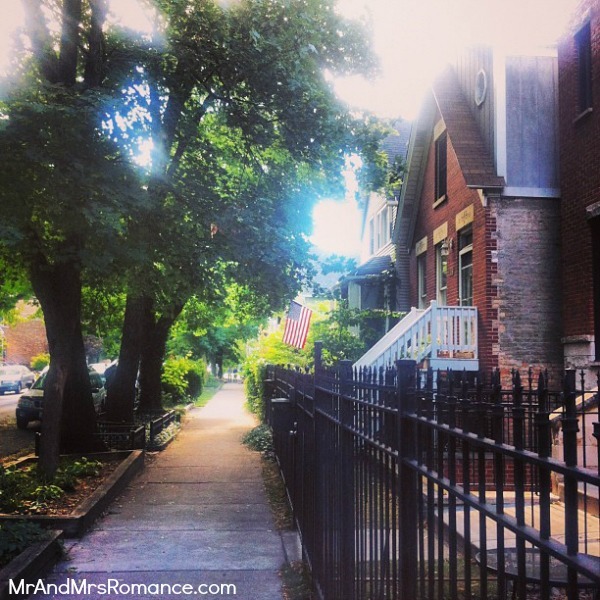 We discover and explore Bucktown and Wicker Park. Great neighbourhoods with lots going on, some great streets and shops, and a really good feel to them. Finally after much waiting, dreaming and salivating, I get my Chicago deep fill pizza. On our very last night, we scurry around looking for a place. We hit pizza gold with a place I’ve been eyeing up since we arrived. I avoided it at first because the queues were so long. Now I understand why. 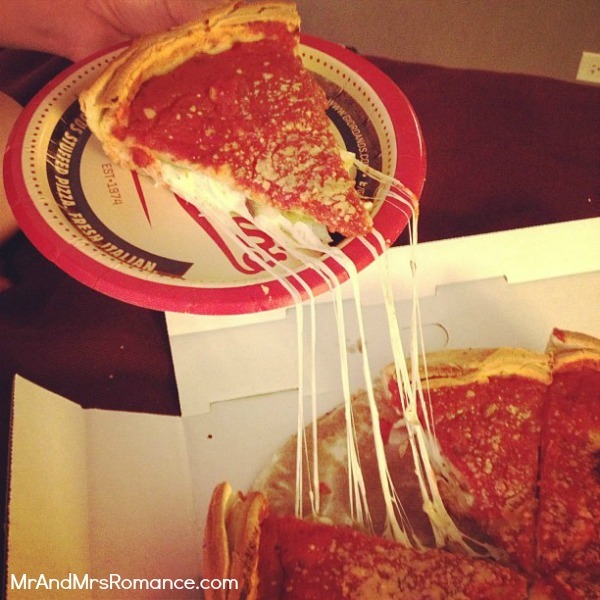 Giordano’s is the home of the deep fill. And this was epic. We avoid the queues by ordering a takeaway then taking it back to our hotel room and biffering it in private. We avoid gluttony embarrassment this way too! We wake early for our next flight and are greeted by this beautiful sunrise. It makes it even harder to leave Chicago. New York, baby! Big Apple, here we come for a big bite of you! 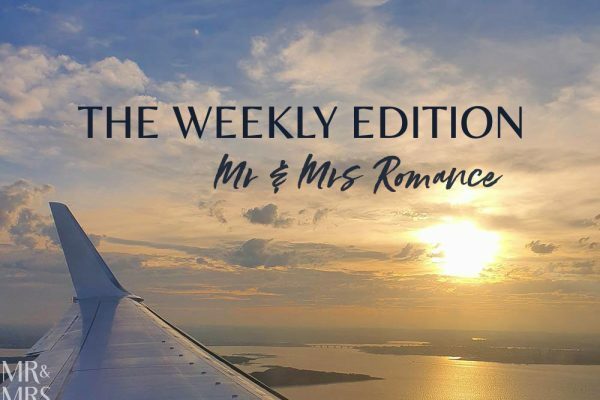 American Romance – Instagram diary: San Diego Part 2.